You’re moving to a new neighborhood – new neighbors, new home, new safety and security concerns. 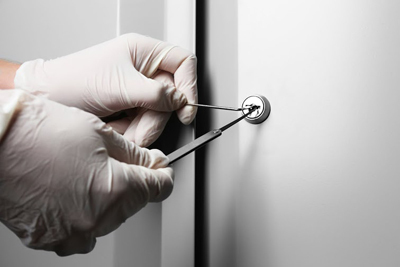 Having already reviewed the options for new lock installations, you begin to wonder if there is anything more you can do to keep your home and family safe. After all, a lock and key will only go so far in protecting your home from burglars. If a robber is desperate, they will consider breaking open a window, forcing a garage door, or even kicking down the front or back door. Below you will find several suggestions that will increase the security and safety of your home in combination with the lock installed. A high security home system may look something like this: properly chosen and highly rated locks combined with an alarm system, hard to reach windows, proper landscaping and outdoor illumination, and choosing the right doors. Each of these provides an extra layer of security for your home that will easily deter burglars. First of all, the lockyou choose should be rated for its security and functionality. Does it have multiple wards against false keys? Is it combined with a keyless entry code that can hook to the alarm system? Can the lock be rekeyed or changed easily? Be sure to consider all of these questions when looking at new locks to make sure you pick the perfect model for your home. Secondly, where are your windows located? Are they high enough off the ground to deter burglars, but close enough to still function as a fire escape? Keep in mind that you can keep a window ladder inside in case of a fire and ask for the windows to be installed higher. Another option would be to make the windows more difficult to get to by planting large bushes underneath the windows. However, these bushes could also function as a place for burglars to hide. If the bushes are near plenty of bright light, then they will be a proper deterrent. Lastly, what kinds of doors are installed on your home? Are they sturdy and difficult to kick in? If not, consider kick proofing your doors by installing a deadbolt lock close to the door jam. Deadbolts are often installed here because it is where the door is weakest and needs the most reinforcement. When installing deadbolts, be sure to install one on every door leading to the outside – including the garage door. As you can see, the security of your home may begin with a lock and key system, but there is much more you can do to prevent burglars from attempting to rob your home.